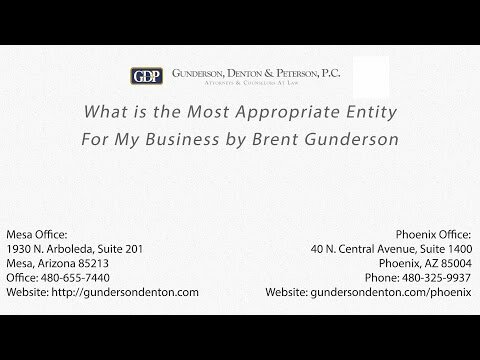 Video: General Business Law at Gunderson, Denton & Peterson, P.C. Gunderson, Denton & Peterson, P.C. can provide to business owners. Not only can Gunderson, Denton & Peterson assist you with your business needs in Arizona, but our lawyers can help you register your business in other states as well. Our lawyers help clients set up corporations and other business entities in other states, including Delaware. Our corporate law professionals also help franchisor clients register with appropriate states. To learn more about the pros and cons of corporations, partnerships, limited liability companies and other business entities and the options available to your business or to begin your business legal plan, contact our law firm. If you want to see if the name of the business you want to set up is available in Arizona, please click here. Gunderson, Denton & Peterson can assist you in negotiating joint venture agreements and financial planning. Our attorneys also draft promissory notes, securities agreements and document the sale or transfer of company assets. Our law firm is experienced with filing documents with the Arizona Corporation Commission including Articles of Incorporation, amendment, domestication or organization, annual reports, etc. We file tax applications or other documents with the IRS or state agencies. Our attorneys provide counsel relating to tax issues with your business. The Mesa business attorneys at Gunderson, Denton & Peterson are experienced in handling issues related to real estate. We negotiate commercial and residential leases and assist with real estate transactions, including repossession, foreclosure or short-sale issues. Our business attorneys negotiate financing, debt management, reduction and settlement with banks or other financial institutions. Our Arizona business lawyers can help you! Gunderson, Denton & Peterson provide clients with franchising services for their business. Our Arizona franchise attorneys assist clients in many different aspects of franchising including the preparation of the franchise disclosure document and the registration of the franchise application with the states. We also assist franchisees with the review of their franchise contracts and documents. Our law firm also assists business clients with collection issues. Our attorneys are experienced in handling collections for small business clients. The lawyers at Gunderson, Denton & Peterson are experienced in negotiating disputes, handling business litigation, business mediation and arbitration should the need arise. Some examples of corporate matters we handle. 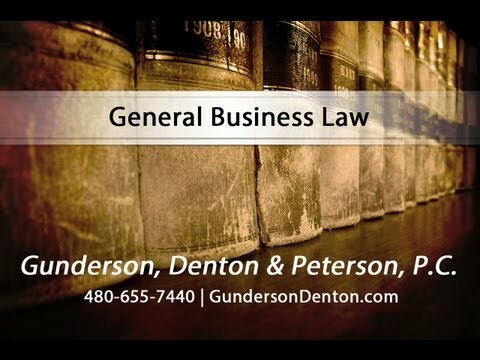 Read the rest of General Business Law at Gunderson, Denton & Peterson, P.C.